The developers of Ratchet & Clank and Resistance really dig gunslinging in the Old West. For all we think of game developers as the people who just sit around all day making games, it's easy to forget that many of them - if not all of them - are gamers themselves, too. Senior community manager James Stevenson at Insomniac Games polled the staff at the studio to find out what games the developers had enjoyed most over the past year. One game showed up in responses more than any other: Rockstar's Red Dead Redemption. 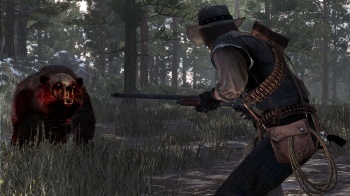 Insomniac's developers praised the immersive setting and engaging plotline, and said that they'd grown connected to protagonist John Marston - one even calling him "one of the absolute best characters in video games" - and even his horse. Resistance 3 creative director Marcus Smith joked that the Undead Nightmare DLC "kind of ruined DLC for the rest of us." While RDR was the most commonly praised game, the Insomniac crew also loved a very wide variety of other titles this year. It's a very eclectic mix with a bunch of games from as wide a variety as you could possibly imagine, whether you're talking genres or even platforms - despite Insomniac's close relationship with Sony, it's clear there's respect there for those on the other sides of the fence. Honorable mentions include Dragon Age: Origins and Uncharted 2: Among Thieves, which came out in 2009 - but some of the Insomniac team didn't get around to playing them until this year. In the comments, Stevenson also explained one of the notable absences - while much of the Insomniac office adored Mass Effect 2, he said, none of them had picked it as their #1 favorite of the year. I don't know about you guys, but I love this kind of thing. It always makes me feel warm and fuzzy reading other developers praise the games of their competitors - not as fellow game designers, but as people who simply love to play games. It's just cool. I wish we'd see more of it.